I've been wanting to make Frosted Sugar Cookies for a while now. I love the idea of spreading a cookie batter in a pan and baking. Less time consuming than having to keep putting new batches of cookies in the oven. I've never been very good at making cookies. I make them too big or they come out flat. I love the idea of cookie bars! I find my boys are much more into cookies than cake and they loved these! Many recipes for cookie bars have a very thick layer of frosting. I decided to use half of the frosting listed below and it was perfect for us. If you would like a very thick layer, then use the full recipe. Preheat oven to 375 F. Spray a 9x13 baking pan with baking spray. In the bowl of an electric mixer fitted with the paddle attachment, cream together butter and sugars until light and fluffy. Add eggs and vanilla and mix for 1-2 minutes. Stir in flour, baking powder and salt until just combined. Gently spread into prepared baking pan. Bake 10-12 minutes. Do not overbake! Let cool completely. Once the cookies have cooled, prepare the frosting. Cream together the butter and icing sugar (I used my mixer fitted with the paddle attachment). Add the vanilla and mix. Next add the milk and mix until light and fluffy. At this point you may mix any food colouring in. Spread frosting on top of the baked and cooled cookies. 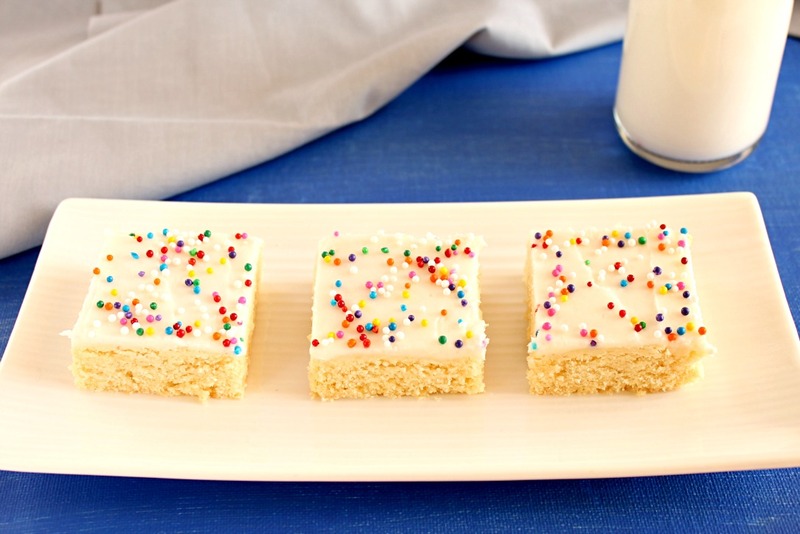 Top with sprinkles and cut into squares. I have actually never thought of making these, but I love the idea now that I see it!